In this conversation, K.P. Yohannan gives practical advice on how to avoid distractions while on your journey with God. QUESTION: We want to follow the Lord, but it’s so easy to get distracted. How do we stay focused? Well, I’d encourage you to think about the privilege the Lord has given you to follow Him. I began my journey serving God when I was barely 17. Now, being a little older, I look back and I can’t imagine anything or anyone in the whole wide world I would exchange for the journey of following the Lord and serving Him. What better thing could we do with our lives than to follow the Lord? And then he says, “Oh, they are nothing.” He makes that statement after he has paused, been silent and meditated on what is to come: when he will enter into eternity where there is no time. So what made all the difference for Paul? It was that he focused on what is to come. And you know, heaven is not heaven because of the gold and diamonds. No, heaven is heaven because of Jesus. And that’s what we are looking forward to. But maybe you’re wanting something practical you can do. Because we are humans and we easily become preoccupied, it is good to have a few minutes in the morning to stop and pray and read a couple of verses. Then at noon and in the evening, do the same thing. That will help keep our hearts from getting cold and hard. And then, watch out for distractions. QUESTION: What kind of distractions? There are a million things that can distract us. John Bunyan’s Pilgrim’s Progress talks about many things that shift our focus and make us weak and feeble so that we want to give up. Listen: We are called to hope and trust in God. He will go before us. We shouldn’t put our focus on or dwell on the unknown. The enemy will use that. But if you fear God and know He is sovereign, nothing will destroy you. Second, if we are not careful, we can become preoccupied with the cares of this life. As Jesus talked about in Matthew 13, in this race, all of a sudden, you can become concerned about comfort and ease and material things, especially when people are asking you, “What about your future? What about this college degree?” If that happens, talk to them about people who lived 100 years ago. They made the money and did all the things people talk about, and what happened to them? They are under the ground, and they didn’t take one penny with them. We need to be careful. Jesus warned us that the cares of this life will destroy our hearts. And the third thing I would say to be careful of is introspection. One of the devil’s main strategies is to make people preoccupied with themselves. Even when you are doing well, you can look inside and see the hypocrisy, the lack of reality, and you blame yourself. That’s how the devil works; he is the accuser of the brethren. Introspection is like quicksand: The more you struggle with yourself, the faster you go down. QUESTION: What can we do to avoid getting trapped in introspection? You know, Peter failed miserably when he denied Jesus. He had every reason to look inside himself and despair. The only reason he made it through was that he met Jesus on the seashore. Jesus didn’t ask, “Peter, why did you do all that?” No, Jesus never asked one question about it. What helps us overcome getting caught up in ourselves is knowing that Jesus loves us. I mean, who among us doesn’t have sin or discouragement? Who among us doesn’t fail? There are a million things we don’t want to let anybody know about us, but He knows them all. And He is not discouraged about us—you need to know that. He will fight for you till the very last second of your life so you will make it. When you are down, He will carry you. When you don’t know what to do, He will shine the light brighter for you to see it. Sometimes it’s through a song or an email or a book or something, so don’t focus on yourself. Take one look at self and ten looks at Jesus. QUESTION: Is there anything we can do to ensure we’ll follow the Lord all the days of our lives? But to try to figure this whole thing out, how we are going to survive in this battle, is nonsense. All we need to do is leave everything in the Lord’s hands and trust Him. He promised us in Philippians 1:6 that He who began a good work in us would complete it. And He will. Pastor Dhinanath walked down the streets of the red-light district looking for Ida. If he was going to carry out his task, he needed permission from the prostitutes’ leader. 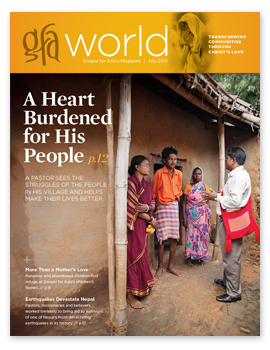 With a heart of compassion, Pastor Dhinanath explained to Ida why he was there. God had given him and his wife, Lydia, a vision and a burden to serve the prostitutes and their children living in the red-light district. Dhinanath gave Ida a Bible and asked her to read it. The words inside that precious gift were all he had to offer the women, but he knew it could change their lives. When Ida agreed, Dhinanath set off to share little booklets with messages of hope to the women trapped behind bars of despondency. The prostitutes received the booklets but were unsure why a man would come to give them gifts. “What are your intentions for coming here?” they asked him. Dhinanath shared about Jesus Christ and how the Lord had changed his own life many years ago. Forty women listened to his testimony, wondering if they could obtain the new life Pastor Dhinanath had received. “Please come visit our slums often to share about Jesus Christ,” they told him. For six years, Pastor Dhinanath has been ministering to the women in the red-light district, sharing the hope of Jesus. When he is able, he organizes gift distribution events that offer the women another source of income, film showings that show the heart of Christ, and literacy classes that have helped 18 prostitutes read and write. His wife, Lydia, cannot enter the areas where the women work because of safety concerns, so she ministers to the prostitutes’ children instead, helping with Sunday School and VBS. Pastor Dhinanath carries the vision God gave him and Lydia six years ago close to his heart as he walks the streets of the red-light district, inviting 260 women to experience freedom and a new life. Kaarina, had been a prostitute for seven years when she met Dhinanath. She was working outside her village when a group of young men began harassing and torturing her. Kaarina fell unconscious, and when she awoke, she found herself in the red-light district. From then on, agony and pain filled her life. She wondered if she would ever find a way out. Pastor Dhinanath was not the first Christian the 47-year-old had met, but he was the first one she listened to. He shared about Christ’s love, forgiveness and restoration. When God healed her of serious back pain, Kaarina knew this God that Dhinanath talked about was real. She decided then to make Him the central part of her life—and she vowed to leave behind the red-light district. It wasn’t easy; people hated her because they knew of her past, but with God’s help, Kaarina found new work as a maid. Suvali rubbed the sleep from her eyes as she got out of bed. It was midnight, but someone had called needing her help. She woke her teenage son, and they both went out into the darkness. When they arrived at the home, Suvali asked her son to open the Bible they had brought and read Scripture. Being illiterate, she couldn’t read it herself. As God’s Word penetrated the air, the person lying before them began to thrash around. Suvali started praying out loud, seeking the healing power of Jesus to bring deliverance and restoration. Soon, the power of God entered the room, and the person was made well. Suvali was once in desperate need of prayer herself. Only years before, Suvali was in the same condition as those she now prays for. Every day, spirits harassed her. Her family tried to get rid of the torment by taking Suvali to witch doctors and temples, but it was only through the prayers of one of God’s servants that she became well. On the day of her deliverance, Suvali and her family devoted their hearts to Jesus. Ever since then, they have lived as testimonies of the Living God’s love—and especially His power to heal and deliver. Many times, the Lord has used Suvali to bring physical and spiritual healing to the people in her village. She’s even been asked to pray for ailing livestock, and the Lord answers her prayers. As word spread of Suvali’s special gift of healing, some people rose up against her and her family. During one religious festival, a group of men forcibly took Suvali’s husband to the nearest temple and commanded him to worship their gods. But Suvali’s husband did not bend. Surprised by his strong stand, the men let him go. Even though there is a group of people who oppose Suvali’s ministry, she continues to pray for those in need, ready at any hour of the day—or night—to share the Word of God and to be used as His instrument of healing. So far, 25 people have come to know the Lord though Suvali’s prayers and testimony. Suvali was an uneducated, illiterate woman, but her heart cried out with gratefulness to her Deliverer. The Lord saw her simple faith and her willing heart, and He knew He could use her to bring freedom to many others. All alone. Jivin’s wife, parents and brother wanted nothing to do with him. It was his own fault. His behaviour had left him lonely and destitute. As he walked along the road, a friendly stranger approached him. He might as well talk to the man. The stranger began talking about a God who had given His life to redeem people from their sins. Confronted with a message of hope—and someone who would listen—Jivin told the man, GFA-supported pastor Shami, his story. Jivin, 55, had lived with his parents, wife and four children and worked as a labourer to provide for them—at least that’s what he was supposed to do with his income. Instead, Jivin spent all his earnings to fuel a relentless addiction to alcohol, leaving his family in poverty. When Jivin would come home from work and a day of drinking, he’d argue with his wife and unleash a fury of blows on her and their children. Then, one day, Jivin stopped going to work. The family’s already precarious financial condition grew even worse: They had to survive on one meal a day. Eventually, Jivin’s wife and kids couldn’t endure his behaviour any longer—they left. His parents lost patience with him too, and they kicked him out of the house. But Jivin kept drinking. With nowhere else to go, he went to his brother’s house, and he ended up in a fight with his brother—and with stitches in his head. The day Jivin met Pastor Shami, he walked along the road in despair, alone and broke. When Pastor Shami invited Jivin to his church, Jivin went. He learned about Jesus Christ and experienced a sense of peace he’d never known before. So he returned the next Sunday. As Pastor Shami and the believers prayed for Jivin, he felt a burden lift from his heart. He eventually decided to place his life in God’s hands, and his newfound trust in Jesus gave him the power to overcome his alcohol addiction. Jivin went back to his wife and parents and asked their forgiveness. When he told them how Jesus had transformed his life, they all believed in Christ. Because God’s love reached down to Jivin and freed him from the chains of alcoholism, Jivin and his family now join the other believers in worshipping their great Redeemer. Millions of families in Asia live under the crushing weight of alcoholism. It’s destroying families and bringing shame to those trapped in its clutches. But God is powerful enough to deliver those addicted to alcohol, just as He did for Jivin. Pray for deliverance and for God to bring believers to share hope with them at just the right time. Please also intercede for the healing and restoration of families affected by alcoholism. The story was all over the news: A businessman, after withdrawing $100,000 at the bank, stopped at a store and placed his briefcase full of money beside him on the checkout counter. A man standing next to him engaged him for a few seconds in a conversation while another man walked up, grabbed the briefcase and disappeared. When the businessman turned around, his money was gone. He panicked. The crime was caught on the store’s surveillance camera and serves as a warning that a few seconds of distraction is enough for you to lose your most valuable possessions. One of our enemy’s tactics is distractions. He tries to attract and divert our attention, confuse our mind, sidetrack our steps and draw us away from our God-given focus. So often we don’t recognize what’s happening until much later when we find ourselves way off course. Recognizing distractions is vital in serving God and fulfilling our calling as His witnesses. Nehemiah had left his prestigious job as the king’s cupbearer, along with the comfort and luxury of life in the palace, to travel to Jerusalem to rebuild its destroyed walls. He rallied and inspired the returned exiles for the task, but soon he ran into opposition from the enemies of the Jews and their undercover collaborators. They requested an urgent meeting with him. They spread lies about his faithfulness to the king. They circulated rumors of threats on his life, and they even hired a prophet to deliver a false message to get him to stop the work and go into hiding. Jesus replied, “Get behind Me, Satan! You are an offense to Me, for you are not mindful of the things of God, but the things of men” (Matthew 16:23). What about us? Do we recognize distractions as being distractions, especially when they are very good things? For example, once I wanted to look up an event from early Christianity, so my son brought me an 800-page Church history book from the library. I could have gone to the index and straight to the page that answered my question, but I didn’t. The book and the pictures were too intriguing to put down, and instead of spending 10 minutes, I found myself spending all afternoon reading about interesting things that had nothing to do with what I needed to know. We are surrounded by hundreds of good causes, wholesome activities, wonderful opportunities, as well as a host of electronics and the world of internet, that all compete for our attention and the precious time we have to reach this world for Christ. If we don’t recognize distractions, we become victims of good things. Yes, as human beings we need times of rest, to unwind from our stressful work and have special family times and activities. However, we must be careful that the good things don’t take over our focus and the time we once used to spend in prayer and in God’s Word. Life moves very fast. We have only a short time before it’s over. Let us not get caught in the web of seeking the things on earth. What then must we do to keep our focus? We must be aware that distractions, especially the ones that make us happy, entertain us and fill our days with excitement, are easy for us to accept, but saying no to temptations and yes to inconveniences and to the way of the cross is what we have to deliberately choose. Therefore, we need to be alert and discerning and honestly judge our hearts to see where we are with our focus regarding the purpose of God for our life here on earth. We also need to realize that we are not strong enough to finish this race on our own. We daily need to ask God for wisdom, discernment and grace to stay on course. Then at the end of our life, we will be able to say, along with the apostle Paul, “But none of these things move me,” (Acts 20:24) and “I have fought the good fight, I have finished the race, I have kept the faith” (2 Timothy 4:7).